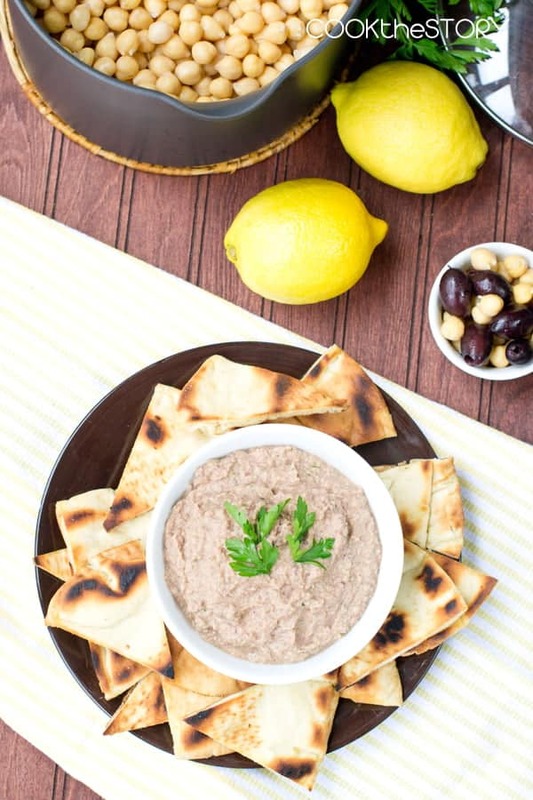 This Kalamata Olive Hummus Recipe is made from scratch, starting with dried chickpeas. It’s served with Homemade Pita Chips that are toasted in a skillet so that it’s quick and easy to make up a batch whenever you need a dipper. This recipe and blog post are sponsored by Anolon Gourmet Cookware. And Anolon is also sponsoring an amazing giveaway here on COOKtheSTORY. Head to the bottom of this post to enter to win an 11 piece Anolon Advanced Non-Stick Cookware Set, value $299. Did you know that the first recorded hummus recipe dates back to 13th century Egypt? That version is printed in a cookbook with the translated title “The Description of Familiar Food,” which makes me think that hummus was around for awhile before that recipe appeared. That first recipe is similar to the hummus recipes we know today in that it’s a dip made mostly of pureed chickpeas. However, that old recipe used vinegar instead of today’s lemon juice. And it didn’t include garlic. I’m positive it’s the garlic that’s made hummus such a popular dip today. And is it ever popular! I’m astounded by the number of hummus brands and variations at my local grocery store. The convenience store at my gas station even has two different kinds of hummus, found right next to the butter and eggs. Even though hummus is so easy to find, I still like to make my own sometimes. Usually I use canned chickpeas. But sometimes, like when thoughts of 13th century Egyptian recipes are in my head, I get back to basics and start with dried chickpeas. Using dried chickpeas is cheaper than using canned ones, especially if you want to make a big batch of hummus. If you make a big batch note that it freezes well so you can make it and then have homemade hummus in your freezer for ages. I don’t usually make a big batch though. 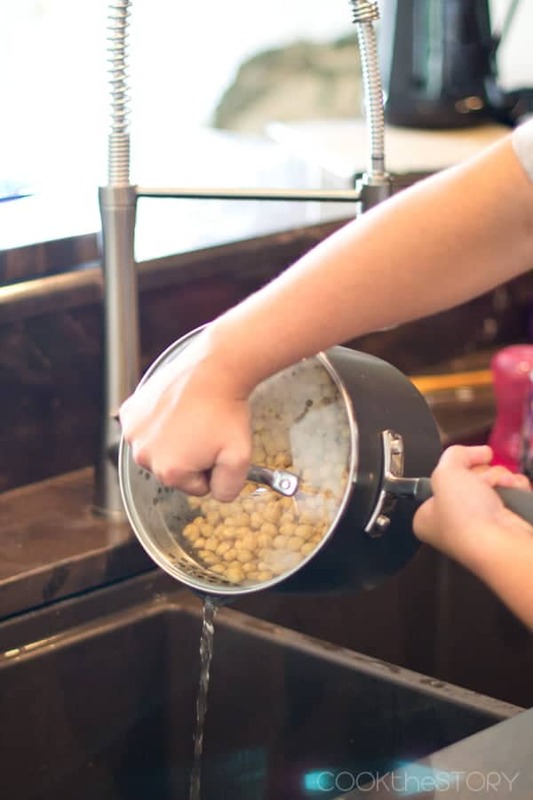 What I do is to soak a 16 ounce bag of chickpeas overnight in a 3 quart saucepan. Then I drain them, add more water, bring to a boil and simmer them for about an hour (sometimes longer is needed). But I don’t make hummus out of all of them. Instead, half go into a batch of hummus like the recipe below. I put the other half in a freezer bag and into the freezer. From there they’re ready to add into my kids’ lunches (they both like chickpeas) or to add to stews and soups. It’s even more convenient than getting out a can because I don’t have to drain them and I can get out the exact amount that I want every time. 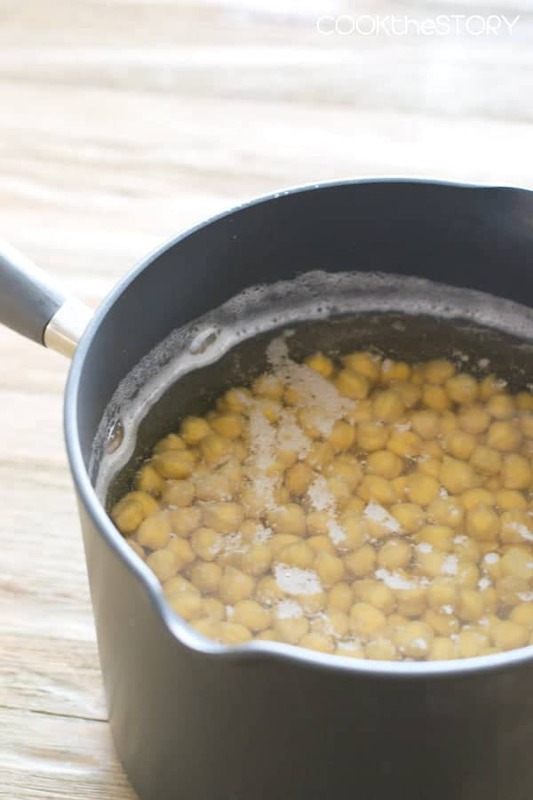 As to the soaking and cooking of the chickpeas, because there is so much draining and refilling of pots, I really love to use a pot with a built-in strainer. This one is from the Anolon Advanced cookware line. The strainer is right in the lid so that I don’t have to dirty a strainer each time I drain the chick peas. Once the chickpeas are cooked, I put them in a food processor with olive oil, lemon, tahini, garlic and salt, sometimes adding a drizzle of water to get the right texture. That’s the way I usually make it. For today’s hummus recipe I wanted something a bit more special. I therefore added a drained jar of pitted Kalamata olives and a whack of parsley. It’s ends up being the perfect place where hummus and tapenade meet. If you’re making your hummus from scratch it doesn’t make sense to use store-bought chips to dip into it. I therefore made some homemade pita chips. Don’t worry though, I didn’t take the “from scratch” thing too far; I used store-bought pita at least. 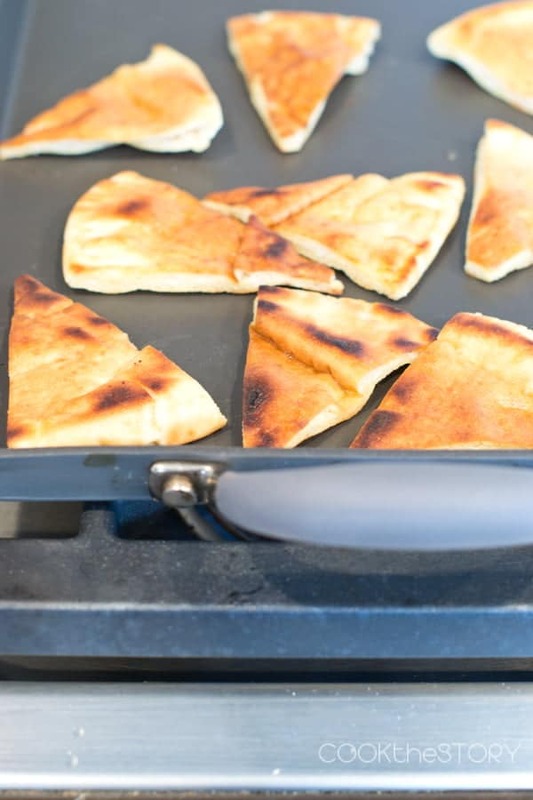 I sometimes do my pita chips in the oven, like this version by the Pioneer Woman. But doing them in a non-stick skillet on the stove is quicker. Plus, I really like the dark spots that you get this way. Note that I’ve used the Double-Burner Griddle from Anolon (pictured above). I love that you can use metal utensils on it. This is because of its hard-anodized construction. For pita chips, this is great because you’re going to want to get in there with your tongs to flip things over. You can probably tell that I’m really excited about Anolon cookware. And I’m excited that you can find these amazing products at Macy’s for 20% off throughout August (open stock items only). Even more exciting, I have a bunch of Anolon Advanced Cookware to give away to one lucky reader. At the bottom of this post you’ll find an entry form to fill out for a chance to win an Anolon Advanced Non-Stick 11 Piece Cookware Set. You’re going to love this non-stick hard-anodized set with soft silicone handles. You can use metal utensils with these items, which is my favorite thing. 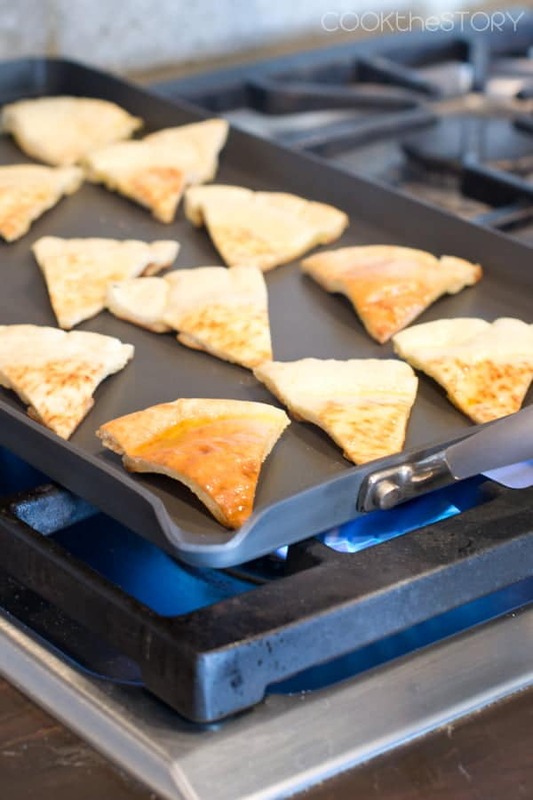 And they’re oven-safe (up to 400F) so you can go from stove to oven easily. Scroll down to enter to win. 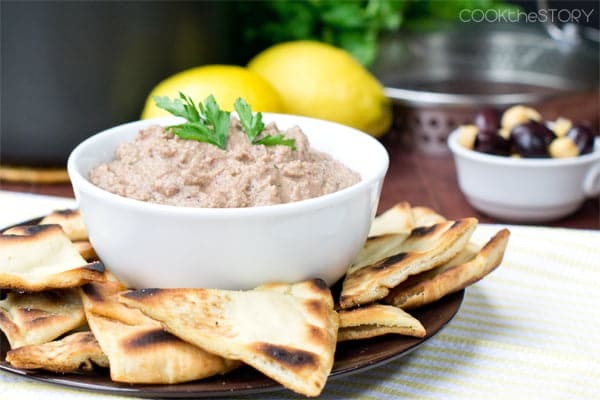 To get my From Scratch Kalamata Hummus Recipe with Homemade Pita Chips, click here and head over to the Anolon Site where my recipe is being featured. Can’t wait to try this at home. The pics looks really delish. I love adding garlic and roasted peppers to hummus. We LOVE hummus! I add more garlic. Whatever the recipe,I add more garlic. I also sometimes add red bell pepper and chopped spinach for color. Roasted red peppers, olives, and garlic! I’ve never made hummus from scratch before but I’d probably add some cinnamon, sugar and maple. chickpeas, olive oil and lemons! I like to add chipotle peppers to hummus to give it a little kick! My ultimate favorite ingredients to add to hummus is always jalapeno peppers. I like mine hot and spicy. I just picked up some sesame seeds in bulk on sale, so I’m looking forward to making my own tahini, which I’ve avoided until now since it is so expensive! My favorite hummus recipe is pretty simple- chickpeas, olive oil, garlic, lemon juice ans a bit of sea salt and black pepper. Thanks! 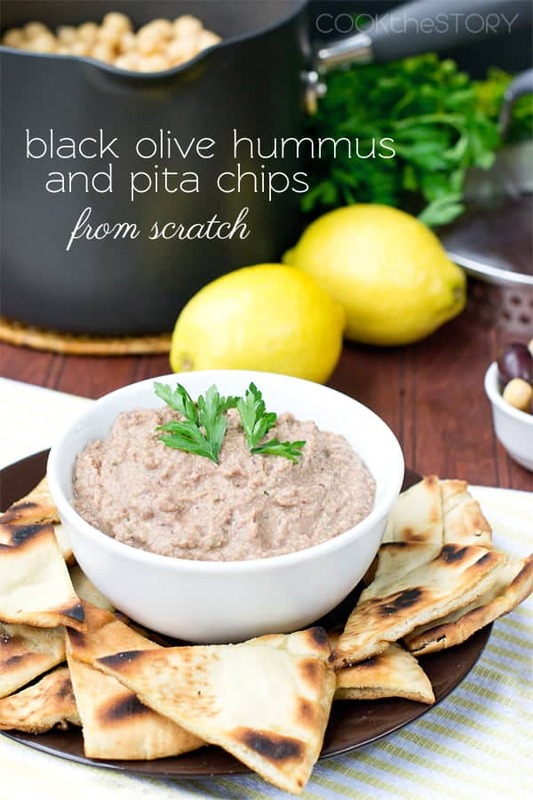 I like basic plain hummus as a rule…thanks for the great post! I haven’t made it before but I like things spicey so possibly some jalapeno peppers. I love to add finely grated carrots into my hummus, creamy hummus with the crunch of carrots. To my hummus I like to add cumin, sprinkle with paprika and sometimes I sauté pine nuts and/or ground lamb to put on top. Woah! This sounds absolutely delicious. I think I could eat a whole bowl of this hummus in one sitting…is that allowed?? I love hummus with toasted pine nuts! I love roasted red pepper added to my hummus! I love hummus, but I am a hummus purist — I always just buy plain hummus. I need to start making my own! I love roasted red peppers in my hummus! I have one piece of Analon cookware and I LOVE it!